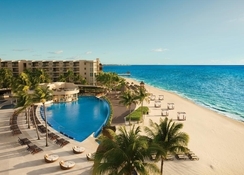 Dreams Riviera Cancun Resort & Spa is a family-friendly, luxury resort surrounded by sparkling pools, lush tropical gardens and the emerald blue Caribbean Sea. Located near Cancun and Playa Del Carmen, this award-winning resort is the perfect place for a vacation with your family. Among its many highlights, the hotel features suites with private pools, a Maya-themed explorer’s club and breath-taking ocean-facing rooms. 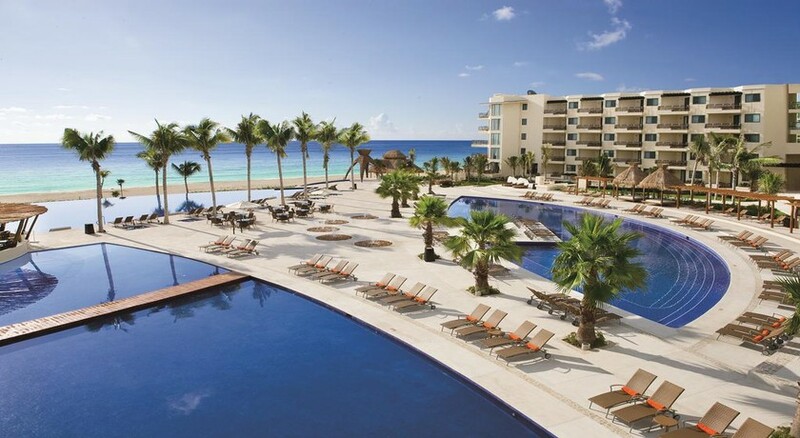 Take a dip in one of its three pools, bask in the sun on the private beach, enjoy water sports, tee off at nearby professional golf courses, or pamper yourself at the luxury spa – Dreams Riviera Cancun Resort & Spa ticks all the boxes. The hotel takes the concept of ‘all-inclusive’ to whole new level and gives its guests a range of luxury facilities and amenities, which are all included within the room charges. It includes unlimited access to gourmet a-la-carte restaurants, international liquor, concierge services, room services, maid services, free entry to beach and theme parties, free Wi-Fi and international calls to USA, Canada and Mexico. Ideally located between Cancun and Playa del Carmen the hotel is just a short 25-minute drive south of Cancun International Airport. 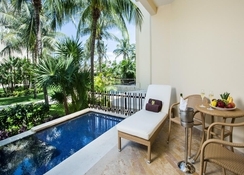 It is situated along a stretch of natural pure white sand beach in the Riviera Maya. 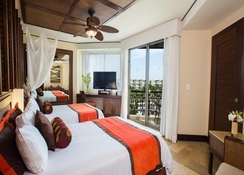 The hotel has 486 guestrooms and suites, all of which are stunningly designed and comfortably furnished. The warm tones of the walls done up in shades of beige, bronze and burnt red are a perfect complement to the breath-taking ocean views of the room. The rooms are divided into the following categories: Premium Deluxe Garden & Tropical View, Premium Deluxe with Plunge Pool, Premium Deluxe Ocean View, Preferred Club Ocean View & Pool Front, Preferred Club with Plunge Pool, Preferred Club Ocean Front Honeymoon Suite, Preferred Club Ocean Front Master Suite, Preferred Club Ocean Front Governor Suite and Preferred Club Ocean Front Presidential Suite. The rooms come with queen-or king-sized beds, indoor Jacuzzi, Preferred Club privileges, spacious private terrace and so on. 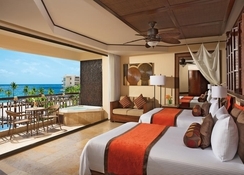 Dreams Riviera Cancun Resort & Spa has six a-la-carte restaurants, a buffet restaurant, a café and a grill to choose from. Bordeaux is the hotel’s fine French dining restaurant. The Patio serves authentic Mexican cuisine, while Himitsu is the hotel’s Pan-Asian restaurant. Oceana, with its beautiful beachfront location, serves freshly grilled seafood, while Portofino is your go-to restaurant for all things Mediterranean and Italian. The World Café remains open 24 hours and serves delectable snacks and freshly brewed coffee. Finally, Seaside Grill is the place where you get grilled delicacies. The hotel also has a beach bar, a lounge bar, a pool bar, a lobby bar, swim-up bar and a spa bar. 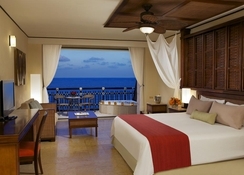 At Dreams Riviera Cancun Resort & Spa, you can do whatever your heart desires. Soak up the summer sun at the pools or the private beach. The hotel features three pools, two of which are heated, and two outdoor whirlpools. At the beach, you can enjoy fishing and deep-sea diving. Get comfortable with blanket and watch a movie under the stars on the beach. Play golf at one of the many professional golf courses near the hotel or enjoy a wide variety of day trips and excursions from the hotel to the nearby places. Leave your kids at the Explorer’s Club, which conducts a fully supervised kids program with a lot of fun activities. Visit the Chef’s Garden, where cooking class and wine tasting are hosted three times a week, followed by a garden feast. The on-site spa offers massages and body treatments, while the fitness centre is fully equipped to meet the needs of health enthusiasts.